Crews are responding to a wildfire on Baldy Mountain. UPDATE (4:35 p.m.): A pre-evacuation notice issued for the area within a one-mile radius of Baldy Road and Fuller Placer Road in response to a small wildland fire has been lifted. The notice was in place for roughly two-and-a-half hours. Three engines and a helicopter responded to the fire, which was first reported at 1:45 p.m. and was estimated to cover less than half an acre. A spokesman for the Rocky Mountain Incident Management Team said crews were making “good progress” containing the blaze. Fire restrictions are currently in place across Summit County, and campfires are prohibited except in metal fire pits at developed sites. A small wildland fire near Bald Mountain is estimated to cover less than half an acre. Three engines and a helicopter responded, and a spokesman for the Rocky Mountain Incident Management Team said they are making “good progress” containing the fire. Authorities have set up a check point on Baldy road at the Fuller Placer intersection near reports of a small wildland fire last said to cover roughly 25×25 square feet. A pre-evacuation notice has been intiated for Bald Mountain neighborhoods. 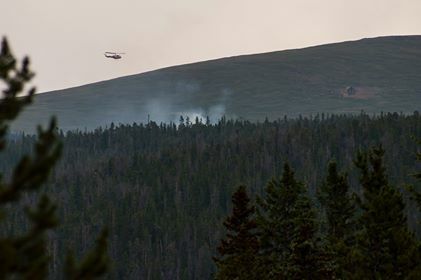 There have been several reports of unattended campfire in the Breckenridge area this morning although officials are not ready to speculate on the cause of this fire. A small plume of smoke was visible from further down the road but we can’t get any closer at this time. Residents are being allowed through the checkpoint. Cloud cover is strong so far in the area.